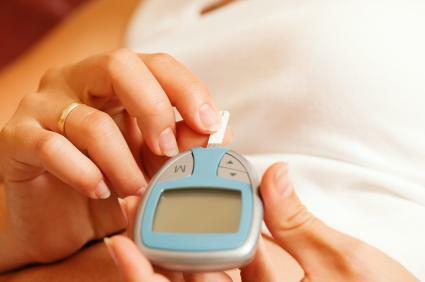 If you have gestational diabetes, you may need to measure your blood sugar levels. If you have been diagnosed with insulin resistance or gestational diabetes, your healthcare provider or dietitian will teach you how to manage your condition. You will be asked to eat differently and monitor your blood sugars during your pregnancy, the goal being to keep your blood glucose within a normal range so that you don't gain too much weight. This will also help to keep your baby from having additional problems during and after birth. Your OB provider might be concerned that your baby will grow to be larger than average and high blood sugars can make both you and your baby sick. When you are eating for gestational diabetes, you need to eat less sugar and fewer starchy carbohydrates. Sugar, rice, pasta, and starchy vegetables such as corn, potatoes, beets, and peas can all cause your blood sugar to go higher than normal. Most of us love these foods, but they can make your blood sugar spike and then drop quickly afterwards -- making you want to eat more. This causes erratic blood sugar levels. Also, the starchy carbohydrates can make it easier for you to gain weight. Eat three meals and three snacks daily. Space snacks so that there is no more than three hours without eating. Eat a late afternoon snack and a bedtime snack that includes some protein. This will help you sleep and to keep your blood sugar more normal during the night. Choose protein to eat with any carbohydrates you eat. Foods with high sugar content, carbohydrates, or juices can adversely affect your blood sugar levels. Avoid adding sugar (white sugar, brown sugar, or honey) to foods. Avoid soda pop, lemonade, and sweetened yogurt as well. Omit juices, but instead use whole pieces of fruit (for example, apples instead of applesauce). Fruit provides fiber and bulk to your diet. Starchy carbohydrates should be a rare treat because they impact your body in the same way that sugar does. Foods that are lower in fat should be a part of your healthy diet while you have gestational diabetes. Select low-fat cuts of meat like baked or roasted chicken or lean beef or pork. Fish is also a good option. Removing the skin from any poultry lowers the fat content as well. Avoid foods fried in oil, such as doughnuts, chips, and French fries. These foods are either high in fat or high in carbohydrates and provide little, if any, nutritional value to you and your baby. Limit foods from fast-food restaurants. Ask for nutritional information on menu selections and choose foods that are low in fat. For many women, a burger and fries or more than 2 pieces of pizza will cause high blood glucose levels. If you want a burger, eat the meat and skip the roll. These foods also are high in salt, so these foods will make you retain water. As you are eating for gestational diabetes, you should spread your intake of carbohydrates throughout the day. Eating some protein with your carbohydrates helps your body keep your blood sugars stable. If your after-breakfast blood glucose levels are outside the target range, you may be asked to shift some carbohydrates (starch and fruit) to other snacks or meals. Choose foods high in fiber: whole grains, vegetables and fruits, beans and legumes, oats, and minimally processed whole grains. Eat lots of leafy green vegetables, asparagus, and other vegetables with lots of color. These are healthy and have a positive impact on your blood sugar because of the fiber they contain. Choose olive oil and even a little butter instead of margarine, which contains trans fatty acids. Do not think of yourself as being on a diet. You need adequate nutrition for your health and your baby's growth and development. Cutting back too much on calories and weight gain can increase your risk of a low birth weight infant. Recent research suggests that an understanding of the Glycemic Index (GI) will help you make healthier food choices to keep your blood sugar within a normal range. The GI is a ranking of foods based on their immediate effect on blood glucose. Carbohydrate foods that break down quickly during digestion have the highest GI and their response is fast and high. Carbohydrates that break down slowly, releasing glucose gradually into the blood stream, have low GI values. Although you may have gestational diabetes, with careful planning you can have a healthy pregnancy. You may not be able to eat whatever you want as some pregnant women do, but you can structure your meals and snacks to still eat plenty of tasty foods. Your health care provider or dietitian will help you plan your diet to keep your blood sugar remains within normal levels and to make sure that you gain the right amount of weight to have a healthy baby.